It couldn’t have been a better evening for Tiger Muay Thai, Phuket, Thailand guest fighters, Trevor Hicks of Arizona and Ty Kelly of Australia. Both nailed second round TKOs sending the crowd into hysterics. First up was 24 year-old Hicks, a former pro football player turned corrections officer from Tuscon, facing Dennua. Although his experience lay mostly in MMA and wrestling, friend and TMT fighter JJ Ambrose encouraged him to study Muay Thai at Tiger. After winning fights in two BBQ Beatdowns thanks to a submission and a knock out, he had the confidence to take it to the big leagues. Broken nose or not, Hicks dominated the fight from the outset knocking his opponent to the ground several times. 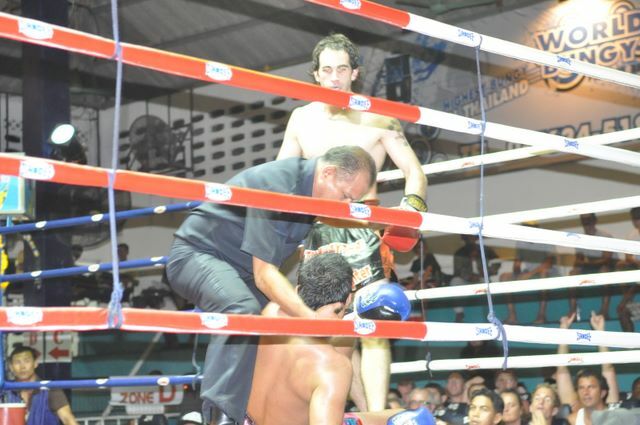 Nearing the end, a flurry of punches resulted in a TKO, much to the satisfaction of Hicks. Kelly, a Sunshine Coast native, was up next. Leaving the Australian Army to study at TMT in June, he already had a taste for success thanks to a five-round fight won by decision shortly after arrival. 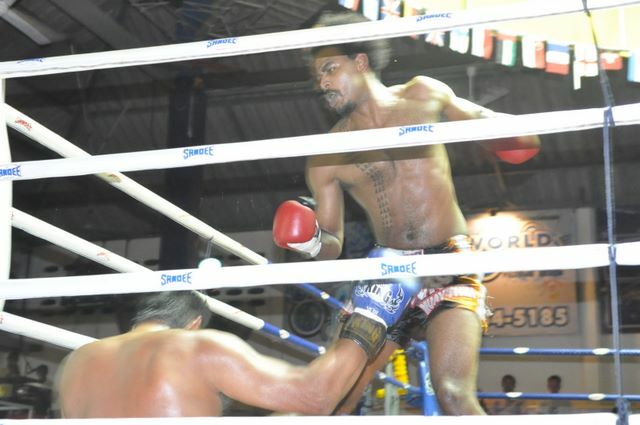 An early right kick to the head bolstered his confidence against opponent Luktum in what Kelly summed up as a “kicking contest” in the first round. Advised by his trainer to start throwing combos in the second, Kelly ended the fight with strong knee to the head after a series of punches. While Kelly plans on leaving in January, Hicks is hard-pressed to give a solid answer.